Leaving on 6th September 2009, a team from Abundant Life Christian Fellowship, who meet at New Row, Coleraine have once again been to Uganda, winning souls for Christ. The team was led by Pastor Ernest Howie. Pastor Howie commented, “The Bible tells us we are in a battle to save the lost”, and during this visit, we were “battling” in every sense of the word. On our first day, a group of Muslims approached and tried to stop our people erecting the platform and sound system. The situation became quite heated for sometime, before commonsense prevailed. We had permission from the local authorities for the crusade and to erect the platform but the Muslin leaders were not happy and tried hard to stop us. Eventually the crusade got started on 9th September and a crowd of several thousand turned up. Many people gave their lives to Jesus Christ. Then, on the second day, rioting and looting broke out in the town, as the result of a political row between the government of Uganda and the King of Uganda. For 2 days the atmosphere was very tense and there were road blocks and security checks in many places. The team, together with the local pastors, met together to pray that the Hand of God would protect them and enable the crusade to continue. There was a concern that the local security forces would not allow the crusade to continue, as such large numbers of people were attending, and might be infiltrated by trouble makers. 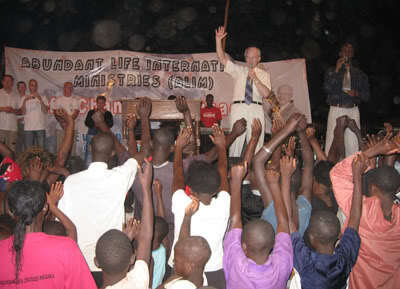 Praise God the crusade was allowed to continue with ever increasing numbers present and there was no trouble. A large crowd gathers at the crusade. On the second night a crowd of about 4,000 turned up, and many more people became Christians, “This was exciting”, declared Pastor Howie, as Masaka is a real stronghold of Islam, traditional religion, and witchcraft. 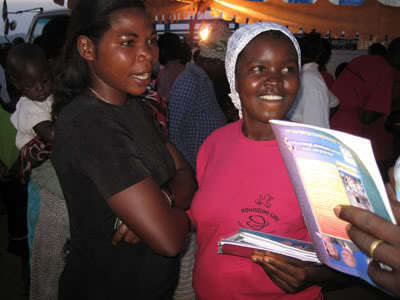 A booklet was given to every new Christian, to guide them in their new walk with Jesus. The team, during the day, visited the local prison, hospital and many schools, and every where they went people gave their lives to Jesus. Humanitarian needs were also met, as food was distributed in the hospital to each patient, also blankets were given to prisoners in the jail. Some members also visited the TASO centre in Masaka, where sufferers from AIDS/HIV come for treatment and encouragement. The Gospel was preached, and over 50 of the AIDS sufferers gave their lives to Jesus. Each person was also prayed for to be healed. 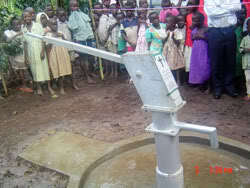 Abundant Life also decided to refurbish and restore a local well, which had become contaminated, at a cost of £2,000. This well provided clean water for approximately 2,500 people. Football and basketball are very popular in Uganda, so at every school, gifts of footballs and basketballs were given. The joy on the faces of the school children was incredible to see, as these were handed over. A regularly heard comment from local church leaders was that “as the Gospel was being preached, human need was also being met”. The chairman of the local pastor committee declared “this is the most spiritually impacting crusade our town has seen in my lifetime, Masaka will never be the same again”. Pastor Howie leading new converts in prayers of faith. 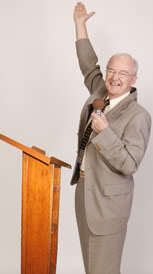 Pastor Howie also had an opportunity on 5 evenings, to broadcast the Gospel to a large audience, in Southern Uganda, part of Tanzania and Rwanda, via the local Christian Radio Station “Top”. The response from listeners was exciting, with many calling in for prayer, healing and salvation. Pastor Ernie and Pastor Mike also assisted in this ministry. As the church of Jesus Christ is growing so fast in Uganda, there is much false or doubtful teaching, so each day, the leader of the Abundant Life team, Pastor Ernest, together with Pastor Ernie and Pastor Mike, held conference meetings of pastors and leaders, attended by approximately 400 people each morning, helping to build them up in the truth of God’s word. The response to these teaching sessions, by the local leaders, was “incredible”, to use their own word, and they were so thankful for the guidance they received, to enable them to fulfil their calling in Christ, as they never have an opportunity to benefit from such an experience. A new convert at the crusade. By the end of the week, almost 1,000 people had committed their lives to Jesus. Hundreds had been healed of various diseases, and many people were set free from demonic power. 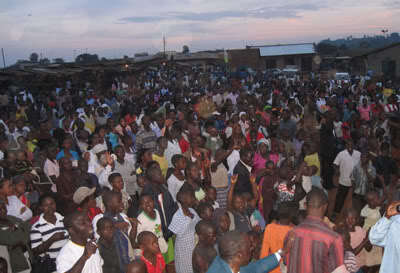 Truly, the power of God had come to Masaka in a mighty way, and His Word was being confirmed with signs and wonders. There was great rejoicing among local Christian people at the way God had used the Abundant Life team to bring down the strongholds of the enemy of sin, sickness and oppressions. On the final day, a baptismal service was held at a local swimming pool, and again the excitement was tangible, to see so many people baptised at one time “It was like the book of Acts”, was the comment heard from many lips. Baptism service at the localpool. The Abundant Life team were joined by 2 Christian friends from USA, Pastor Ernie Clifford and his wife Faye and 4 from New Life Church in Stowmarket, Pastor Mike Smith, with Adria, Julian and Helen, and the other members of Abundant Life were Dorah Nyathela, Nathaniel Whiteman and Gavin Boyd. The team from Abundant Life, together with their friends from USA, returned to Northern Ireland on 14th September 2009. The next crusade is planned for February 2010. If you feel led to support this work financially or believe God is calling you to be a part of what He is doing in Africa, and would like to join us in the work, please contact us through our webpage www.abundantlifeni.co.uk.“Your prayer support is also desired, as the enemy, the devil, does not like what we are doing” was Pastor Howie’s comment, “and we need God’s covering and protection as we continue to bring down the strongholds of the enemy”. “I encourage God’s people in this area to support us, physically, financially and spiritually to ensure that the devil is defeated” was Pastor Howie’s final comment. 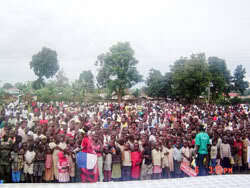 During their time in Uganda, Abundant Life opened a new children's home in Mbale and welcomed 18 more children. Several of them had been abandoned in the local hospital by their mothers. It was great to see the joy and excitement on their faces, as they entered their new home. “We are currently seeking sponsors for these children”, said Pastor Howie. “£20 per month provides food, clothing, school fees and medical needs for each child. Abundant Life takes care of all administrative costs, so every £1 given, goes straight to the child”. If you are interested in sponsoring one of these needy children, please contact Pastor Howie at -028 71302211-, or Sally-Ann Whiteman at -028 71285898-. I had a fantastic time in Uganda. It was amazing to see God touch the lives of so many people. Saved, healed, set free, lives transformed by the power of God. People came alive through spiritual and physical miracles in the mission week in Masaka, Uganda, like I have never seen before in 14 years of ministry. Praise God, keep up the good work, Abundant Life.